Congratulations to Mr. Buff, a Virginia sired 5-year-old Friend or Foe gelding who won his fourth consecutive race and second consecutive stakes. Owned and bred by Chester and Mary Broman, Mr. Buff has now bankrolled $540,786 from 26 career starts. He has 8 wins, 6 seconds and 3 thirds. The recent four race streak has all come at Aqueduct and has occurred in a tight ten week window. He captured an allowance November 14th, an allowance optional claimer November 28th, the Alex Robb Stakes December 29th and the Jazil Stakes most recently on January 26th. Here is a recap of the Jazil courtesy of The Paulick Report. 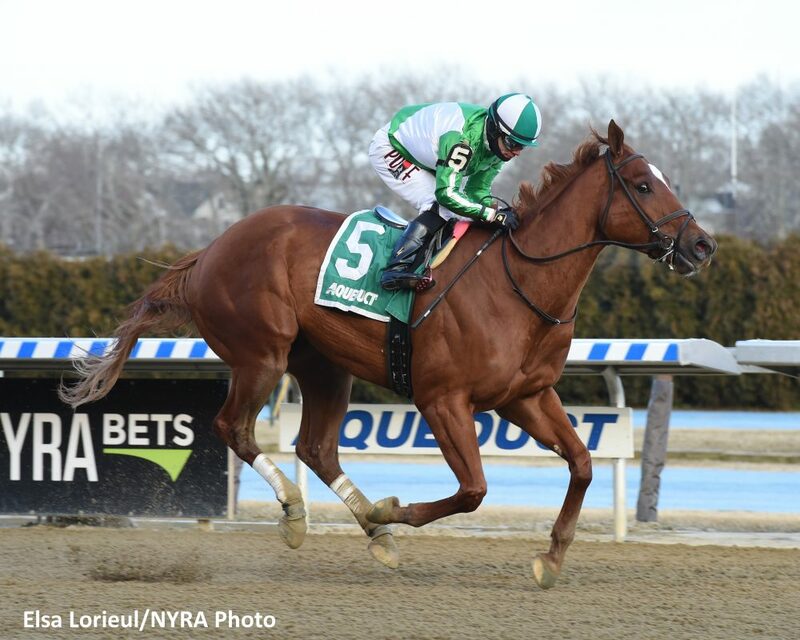 Chester and Mary Broman’s homebred Mr. Buff improved his win-streak to four with a powerful front-running performance to capture Saturday’s $100,000 Jazil at Aqueduct Racetrack. Trained by John Kimmel, the New York-bred Mr. Buff arrived at the 1 1/8-mile test for 4-year-olds and upward with momentum, but in search of his first open stakes score after taking the restricted Alex M. Robb last time out. Sent to post as the 7-2 second choice, Junior Alvarado worked out a prominent trip for Mr. Buff, who broke alertly and muscled his way to the lead through an opening quarter-mile in 25.05 seconds, while under light pressure from Thebigfundamental. Sunny Ridge, the 1-2 mutuel favorite off of a good third in the Grade 1 Cigar Mile, tracked Mr. Buff from third position, travelling wide down the backstretch, as the half-mile ticked off in 49.90 on the main track labelled fast. Mr. Buff came under siege through the final turn as Sunny Ridge advanced and Title Ready followed, but the talented chestnut rebuffed all challengers and surged to a four-length lead at the stretch call. Mr. Buff’s win in the January 26th Jazil Stakes pushed his bankroll over the $500,000 mark. Photo by Elsa Lorieul. Kept to task under Manny Franco, Sunny Ridge persevered the length of the lane, but there was no containing a strong performance from Mr. Buff, who earned a 5 1/4-length score in a final running time of 1:50.71. Sunny Ridge completed the exacta, a half-length in front of Thebigfundamental. Hero’s Welcome, Title Ready and Holiday Bonus completed the order of finish. Backsideofthemoon was scratched. Alvarado, taking over from David Cohen, said he let the horse dictate the pace. Mr. Buff, a Diamond member of the NYRA Starter Loyalty Program, banked $63,250 in victory while improving his record to 8-6-3 from 26 career starts. He paid $9.90. Live racing continues on Sunday at Aqueduct with a nine-race card highlighted by the 42nd edition of the $100,000 Ruthless for 3-year-old fillies. First post-time is 12:25 p.m.